Easy to use business management software designed to give small business the tools needed to run and grow your operation. Avanti is powerful, fast and secure, packed with flexible and unique features to help you get the job done faster. Avanti is designed and developed specifically for small businesses and supported by our UK based team. 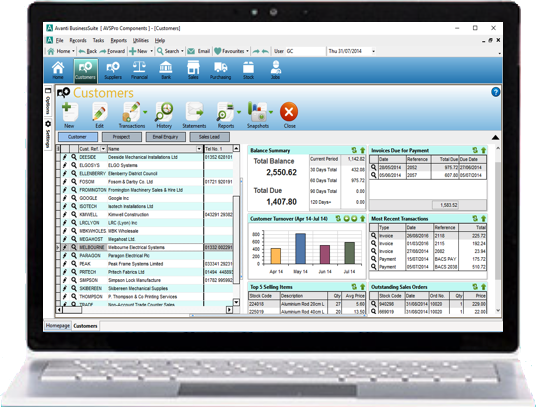 Fully featured & integrated accounting software covering customers, suppliers, banking & powerful financial reporting. Powerful facilities to help you manage your stock levels, track product sales and control every aspect of your inventory. Advanced billing & invoicing features for invoices, quotations, estimates and production of custom, professional documents. Flexibly process your sales from quotation through to picking, dispatch & invoice and keep track of back orders & allocations. Manage your purchasing workflow from order entry to delivery receipt to invoice & produce custom purchase orders. Track leads, convert opportunities & keep a full activity log of calls, emails & quotations for your prospects and customers. Avanti delivers beyond simple accounting software to provide a powerful, affordable and unique business solution to help you unleash your business' growth potential. The needs of your business can often be as demanding as those of larger companies and you quickly find that simple accounting software won't fulfil those requirements. However higher level solutions are often too complex and expensive. Avanti fills the requirement for small businesses to move beyond accounting software by providing an integrated business management solution that is powerful yet simple & affordable enabling you to take the next step. When growing your business it can often be difficult to get a full picture of what is happening at any one time. Avanti gives you a single view of your business to get the answers you need at all times. Avanti business management software gives you clear visibility into your business. It integrates information from across your system to provide snapshots of key business data to help empower your decision making. Avanti provides a complete set of business management software tools to put you in complete control & help you manage & streamline your operation. Developed specifically for small businesses, it's user-friendly interface is simple to learn & easy to use. Dashboards are everywhere in Avanti! From your central dashboard to customer & stock dashboards each giving you at-a-glance snapshots of realtime key information to give a complete view of your business. Keep a track of your customers, sales leads, prospects and enquiries all in one place so you can quickly switch between your customers and your sales prospects. View and produce all of your key financial reports for any periods you need with customisable report structures, full drill-down & realtime snapshots for at-a-glance figures. Excellent & highly flexible sales order processing through stock allocation, picking, dispatching & invoicing. Track part dispatches, back orders, multi-dispatch invoices, unfulfilled orders & more. Maintain unique prices and/or discounts for your products & services for each of your customers. These prices will automatically be used on quotes, sales order & invoices for the customer. Recording stock take changes is a breeze in Avanti. Record all of your changes in a batch by entering the new stock level for each relevant item and the system does the rest. Avanti is a complete business management solution, designed, priced and developed for fast growing small businesses. 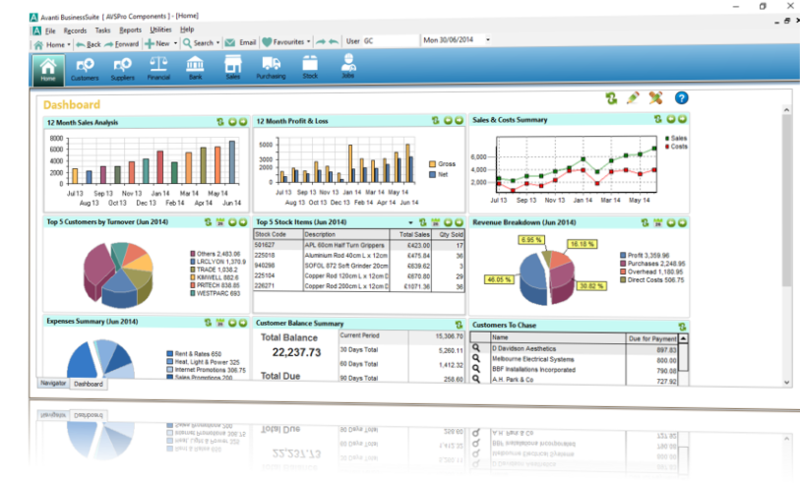 Take the next step beyond limiting accounting software with Avanti. Sign-up for your free 30 day trial now. Nigel Goudge, AQL EMC Ltd.
Mark Day, Somerset Solders Ltd.